Nobody wants to be forgotten! This special day always occurs on November 10th, but nobody seems to know who started it or what year! Whatever the case, let’s use this day to remember and celebrate people who are important in our lives. Remind students that it is important to remember people who have helped them in some way to be a better person. Ask students for examples of times when we make a special effort to remember people we care about (e.g., on birthdays, anniversaries, holidays such as Father’s Day). Discuss the idea that it doesn’t have to be a special day to remember someone. Ask students who they feel they will never forget and why. Encourage students to draw a picture that represents the words in the poem and, if they are able, to print the words to the poem over the picture. Then ask them to give their Forget-me-not picture to someone special. Explain that today, you will be making Forget-me-not flowers to share with others. Search online for instructions for making simple origami forget-me-not flowers. Once the flowers have been assembled, have students discuss with a partner who they will give their forget-me-not flower to and why. Consider asking a local seed or garden store to donate Forget-me-not seed packages to give to special people in their lives who they will never forget. 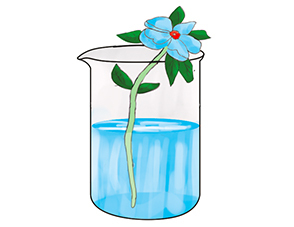 National Forget-me-not Day is a great time to research and identify someone who has made a difference in Canadian history. Students can choose from the list below or they can nominate a special Canadian from their own interests (sports, art, entertainment, etc.). Once they have selected someone to remember, ask them to research the individual and prepare a short oral presentation explaining why that person should never be forgotten. Remind students that the person they will represent does not have to be famous, as long as they are Canadian. They could be a family member, a neighbour or their family doctor!